As we provide customized solution, S S Storage Tanks and Stainless Steel Storage Tanks are available in various specifications & according to customers' requirements. We deal with processing storage tanks which includes dairy, food and pharmaceutical hygiene standards, our storage tanks are featured with elliptical, dished, flat or conical head. Our stainless steel storage tanks are highly durable and needs very less maintenance. Our storage tanks are designed to be durable and maintenance free and are in confirmation with the dairy, food & pharmaceutical hygiene standards. They are also used in connection with boilers or other independent water heating sources to provide storage capacity to meet peak and normal system demands. Note : Prices May vary from Capacity to Capacity. We are well known manufacturer of the wide range of Milk Storage Tanks, used in the food industries that are affianced in the dairy products. Made by using high grade raw materials such as supreme grade stainless steel, these are produced in our latest technology laden production unit. Special care was taken to ensure for cold storage of milk and to avoid fat separation. 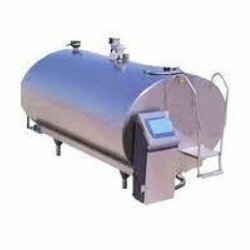 With all international specifications in place, some of the attributes of these tanks are low maintenance, corrosion resistance and easy to install.